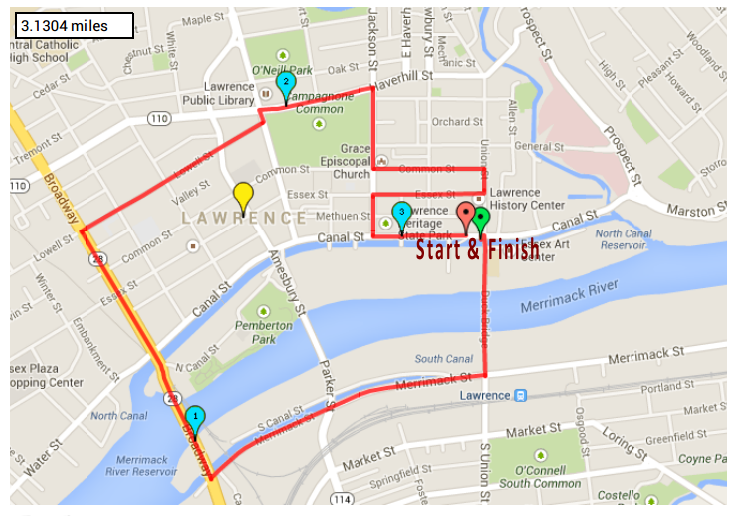 The Lawrence History Center welcomes athletes of all abilities to our 6th Annual North Canal Classic 5k Run/Walk/Roll on Sunday, May 19, 2019 at 8:45 am. The race is in the North Canal district of Lawrence to raise awareness of the History Center in the community, and to promote fitness and economic and cultural development in the city of Lawrence. Net proceeds to support the Lawrence History Center. Online entry fees are $25.00 for the 5k (plus online processing fees) and $5.00 for the kids canal dash (ages 12 and under). Groups of 10 or more people can register for $15.00 per person (with DISCOUNT CODE, plus online processing fees) or via paper entry in advance. Please indicate if you are a wheeled athlete. Race day registration will be $30.00 cash or check. Shirts will be available to the first 200 registered in the 5k road race. Kids Canal Dash: Passes to Canobie Lake Park! Other prizes will be raffled off at the end of the race to be determined. Please visit http://www.lawrencehistory.org/northcanalclassic/2019 for additional information. Note: Groups of 10 or more entries, are $15 per person. Please use the Paper Application below or the DISCOUNT CODE at Checkout (email director@lawrencehistory.org for the Code).